The Y is dedicated to providing high quality, affordable, age-appropriate afterschool enrichment for your child when you cannot be there yourself. The program is available from school dismissal until 6:00 pm following the Gaston County School calendar. Children are served at both School Based Sites and at YMCA sites. Take a look at the information below to see where your child would participate. The YMCA Afterschool Enrichment program is open to all. Financial assistance is available to Y Members. The YMCA serves schools across the county! Specific Afterschool sites are determined through a partnership with the school system and by proximity to each child’s school location. The YMCA offers a Year Round Pricing program that provides care for an entire year with an equal weekly draft. This program starts on the first day of school 2018 and ends on the last day of summer camp 2019. All Teacher Work Days, Half Days, Holiday Camp, Spring Break Camp, Afterschool, and Summer Camp are included. At the time of registration they must select an Afterschool site. Speciality Camps may be attended for an additional fee. Financial Assistance is available to YMCA Members. These funds are raised during the Annual Giving Campaign. Please use the form below to apply. Early registration is encouraged. All full time Gaston County School employees qualify for a discount on both your YMCA Membership and Afterschool Care of 35%. Year-Round Programming is not eligible for this discount. The YMCA is excited to offer four special programs to these students. Registration in these programs includes transportation from their afterschool site. Parent pick up is directly from program staff. Childcare is included with all current Afterschool and Year Round participants. These days are held at the Cherryville, Warlick, and Stowe Family YMCAs from 7:00 am to 6:00 pm, students must arrive by 10:00 am. This program is provided with no additional fee to your weekly draft. Children not currently registered in YMCA Afterschool can sign up for Teacher Work Days if space is available. The YMCA offers full day care during extended school breaks at both the Warlick and Stowe YMCA locations. Full day care, 7:00 am – 6:00 pm, will be provided for all registered at either a daily or weekly rate. 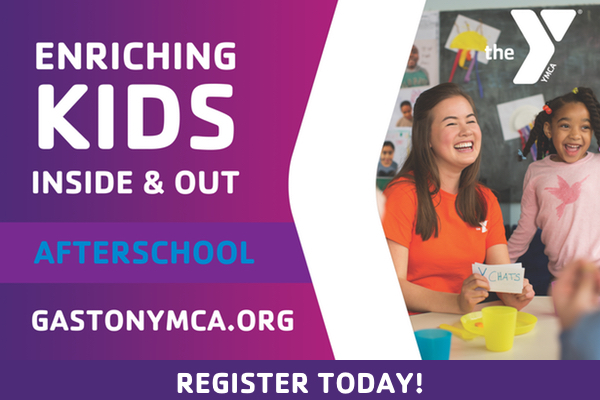 Students registered for After School and/or Summer Camp at the YMCA are not automatically registered or charged for this program. Specific Registration is necessary.